Whether it feels like it or not, summer has snuck up on me. Life has been so busy but I'm really loving the season of being busy...and even though there are days I wish I had nothing to do but lay in the shade and work on my sketching or some hand sewing project, I know that one day soon the busyness will leave just as quickly as it came and I will wish I had taken more advantage of it. So, I'm learning to take one day at a time and make each moment count. Well dear friends, I'm not sure if I'll have any time to post in July so if not, talk to you all in August! Love you! So good to talk to you today! yay! i love that picture! 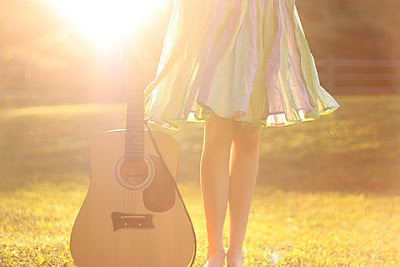 how about some sunshine and music?! and quilts on the grass? and doilies and fabric scraps and organizing beads! hee hee hee!